We’re still on track for the opening of Beta 1 on July 4th, 2018, especially with the progress made this week! Of particular note is Andrew’s very large refactor to building code, which was one of our gating factors for Beta 1. Andrew absolutely hit it out of the park with this update. Check the Top Tenish for all the delicious details. The rest of the team’s progress continues apace, filling me with pride to work with such a talented and dedicated team. What we are doing is difficult, but we care deeply about doing it right. For testing this weekend, we have an iteration on last week’s build that includes a change we need some testing on that may help alleviate our physics server crashes. 12PM EDT – 2PM EDT/9AM PDT – 11AM PDT/4PM UTC – 6PM UTC. If you’re confused about the times, you can go HERE (https://www.worldtimebuddy.com/?qm=1&lid=5,8,100,14&h=5&date=2018-5-12&sln=12-14). We will send out a separate test email later with more details. If you missed our end of the week wrap-up with myself (Tyler), Tim, and surprise guest Andrew, you can find that stream HERE. For the highlights of the week, let’s go to our Top Tenish. Testing: Colin has spent much of this week trying to track down a lingering issue that caused the Physics server to crash. Because of this, we’ve been running an embedded server in our recent weekend tests. We’ve made progress on fixing the issue, but believe there is more to be done. We have been testing this change this afternoon, so this weekend’s test will let us know if we are on the right track. WIP – Tech – Buildings: Andrew wrapped up the giant building refactor. He achieved a 99.2% reduction in the number of bytes required to send an entire building over the network, and reduced the CPU load on proxies from over 75 msecs per connected client to a negligible level. Calculating changes between two states of a building now happens in only a few clock cycles, with comparable savings in network bandwidth for larger changes, like knocking off an entire tower. The code is waiting to go in immediately after the next stable Hatchery-to-Nuada push. Platypus (Camelot Unchained Environment Manager – CUEMAN): Bull is now in the testing and polish phase of a tool that will allow people to create their own local workspace. This workspace will not affect what others are working on, or be affected by others. This can greatly improve developers’ ability to continue to do work when someone breaks the build. WIP – Tech – Warbands: Warbands have been revived, and will be available on Hatchery after code reviews are completed sometime next week! 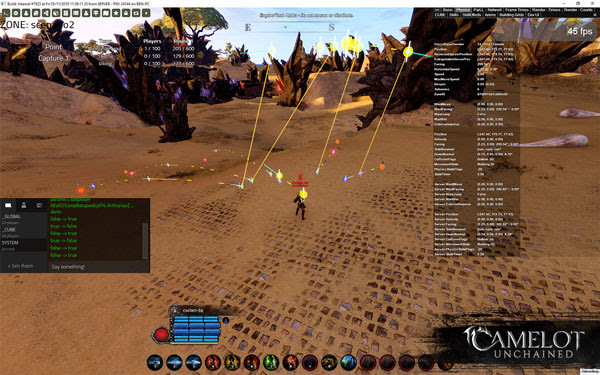 Tech – Client Skill Effect Debugging: Rob finished his 1.0 version of this tool, which now shows all active effects and projectiles when using a skill. Ben is very happy to have this tool. When it helps him find a bug, he asks Rob, “Why this? !” This tool greatly reduces our debugging time. Tech – Wwise Update: One thing we have not spent much time on yet, but knew would be important before the start of Beta 1, is sound. This week, Dave updated our sound engine, Wwise, fixing a problematic issue dB was encountering that would crash his profiler, something necessary to improve audio performance! Moving forward, Dave is investigating and fixing other outstanding issues related to audio performance. We want those large battles to sound great with few to no performance issues. VFX: Arthurian and TDD spawn point models. Place of Power center “spire” VFX. Audio tweaks to center spire and Place of Power model ambient loops. Design – Race-Specific Traits: Ben added and tested several new traits this week. 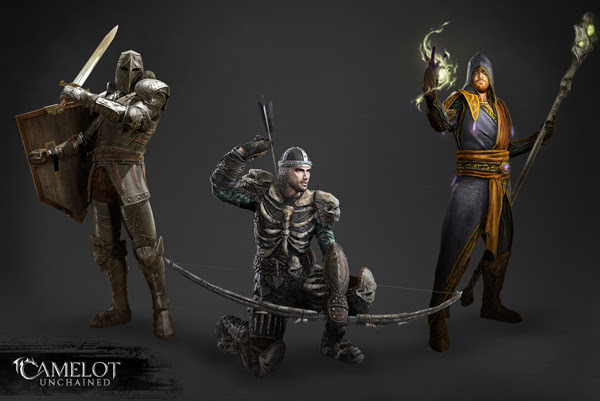 These are specific to your chosen race, and give players more ways to tweak their characters to match their playstyle. WIP – Art – Trait Icons: James is halfway through a second pass of trait icons based on feedback, and has begun working on the race-specific ones as well. 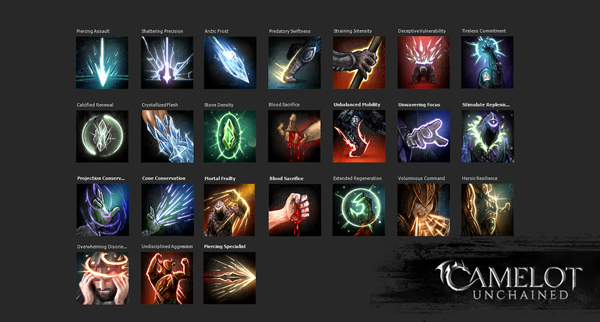 These 70 icons are particularly important to get right, as they will visually convey effects (in the UI) that may be upon your character during combat. WIP – Art – Updated Character Creation Renders: Joe finished off the poses for all the male renders, and has begun on the female variations this week. Once these are complete, they will fully replace the concept art and paint-overs currently in the character creation screens. Much later, we will look to replace these with animated in-game characters. Art – Concepts: This week, Michelle continued work on the character renders from Jon, adjusting them to match the character creation backgrounds in the patcher. 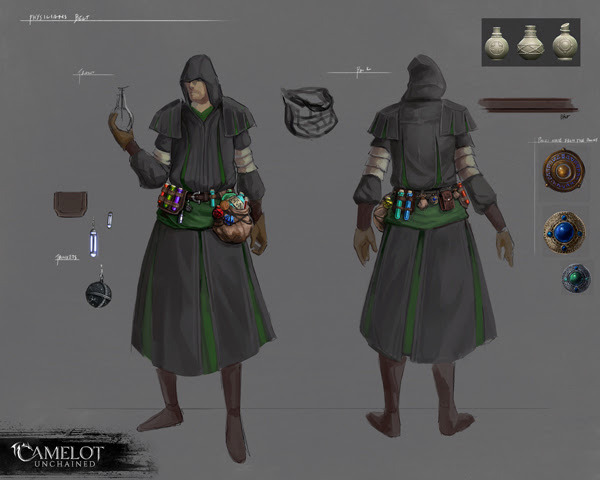 Additionally, she completed a pass of the Physician’s belt for Jon to work on, and continues concepting out VFX for the new class abilities. Art – Modeling – Various: This week, Jon completed several smaller tasks, supporting both characters and environment work. 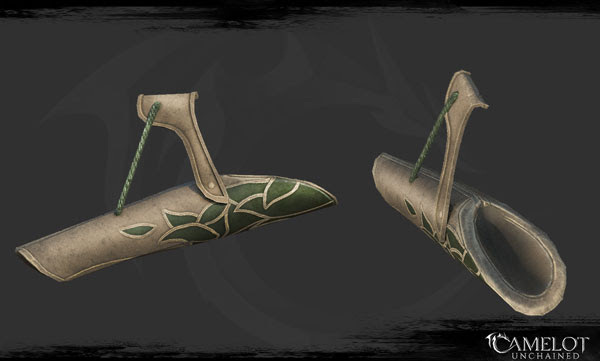 Tuatha side quiver model for the Forest Stalker. Player secondary spawn dais for scenario 2. WIP – Art – Environment Art: Dionne and Tyler’s work this week was mostly performance and collision-related work, as well as adding more variety to the existing assets. Ongoing terrain tweaks and improvements in the scenario 2 map. Poly reduction and LODs of some models to improve performance. Tree and bush hue shift variations for more visual variety (not yet in). New birch trees (there were only two, previously). Placing of control point and secondary spawn point models in scenario 2. 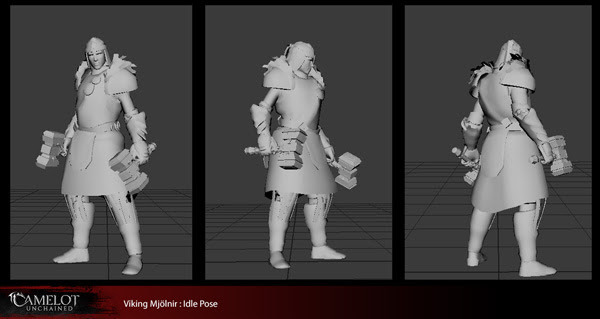 WIP – Art – Animations: Work continues on the new class-specific idles and updated animations. Winter’s Shadow: Sandra finished up the updated basic attack that matches the new combat idle. Forest Stalker: Sandra is finishing up the edits to the basic attacks, now that she has the new hip quiver to work with. Fianna: Scott finished the secondary and movement animations. Mjölnir: Scott began work on this class this week, quickly blocking in basic attacks, deflects, flinch, and shout. Blackguard: Sandra finished her first pass on all the movement animations. For art this week, we start off with some still images of the animation work on the Mjölnir from Scott. 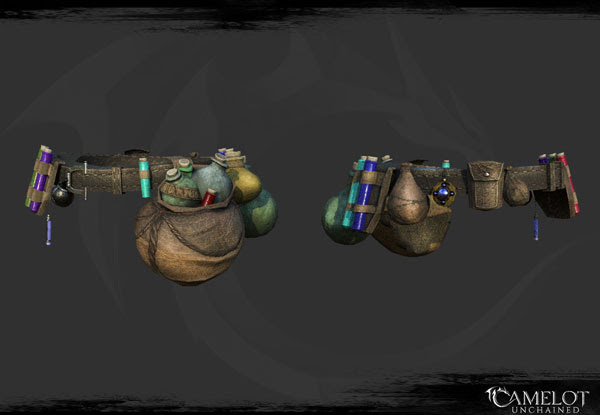 The first image showcases his combat idle. I personally fell in love with this because it has a bit of swagger in it. 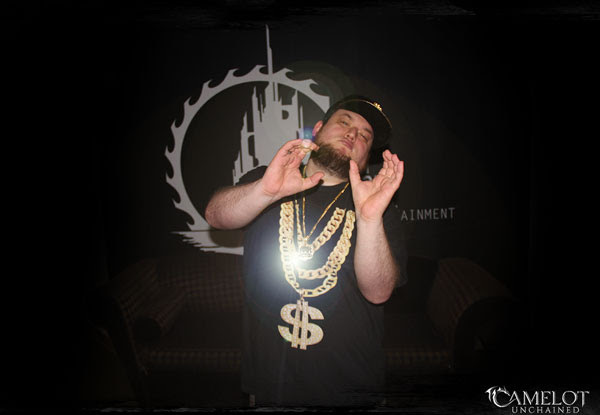 It looks like this guy is gonna mess you up! Next, the left and right hammer crushing basic attacks. 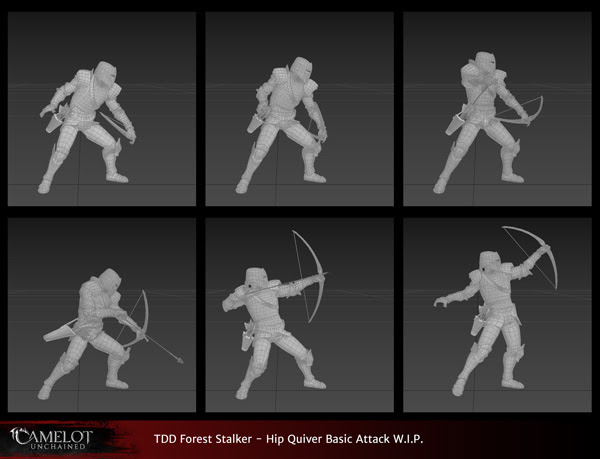 Sandra has been working on updating the Forest Stalker’s attacks to pair up with the side quiver model Jon created. Using a different quiver location further helps us differentiate the classes on the battlefield during this iteration on the animations. 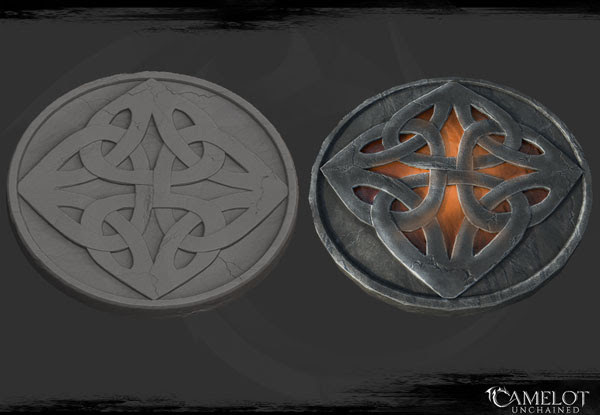 Next up, we have some of the trait icon work from James. As I mentioned last week, I really love these. You have a tiny little window to clearly convey an idea that players need to understand at a glimpse. No easy task! 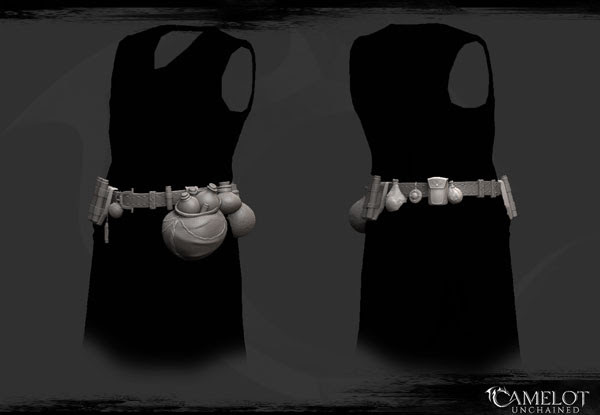 Here we have Michelle’s concept art for the Physician’s belt. We wanted to get this in so Sandra can animate with its use in mind. Jon completed the model, which will next go to Joe to weight and import. You can catch Jon’s livestream of this work HERE. Jon also created the secondary spawn point for the Dragon Fang scenario. And the TDD hip quiver used in Sandra’s animation above. Here’s a fun image associated with the client skill effect debugging tool Rob made. Ben was shooting arrows this afternoon, and was quickly able to see that the client starting position of the arrows was up in the air (those yellow orbs)–then received a server update and saw the arrows snap down to where they should be. As Rob told me, ” Without the tool this would have been, “something funky is going on with projectiles!” But now it’s “The client is clearly putting the projectiles starting position in the wrong place.” That’s way more helpful. To finish off art for the week, Michelle assembled three of the character renders we’ve been creating for the character creation UI in the patcher. These are rendered in an outside program with minor touch-ups from Michelle, but use some of the future character art we hope to update early in Beta 1. I know what you’re all thinking! We must be done with the update. Hold on, there’s more! Thanks go out to Poxer, who sent Max some awesome swag to wear during his morning stream. He even wrote a rap to go along with the gift. If you dare, check out this morning’s stream HERE! That’s all for this week. We have clearly had a productive week, and continue to work through the tasks getting us closer to the start of Beta 1 on July 4th, this summer! Hope you all have a great weekend. As Max clearly represents, we’ll CU later!